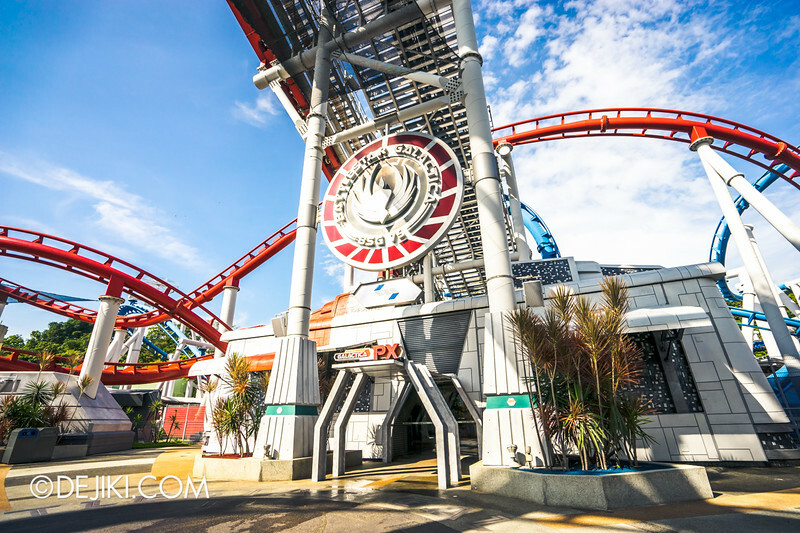 Battlestar Galactica has finally reopened at Universal Studios Singapore! 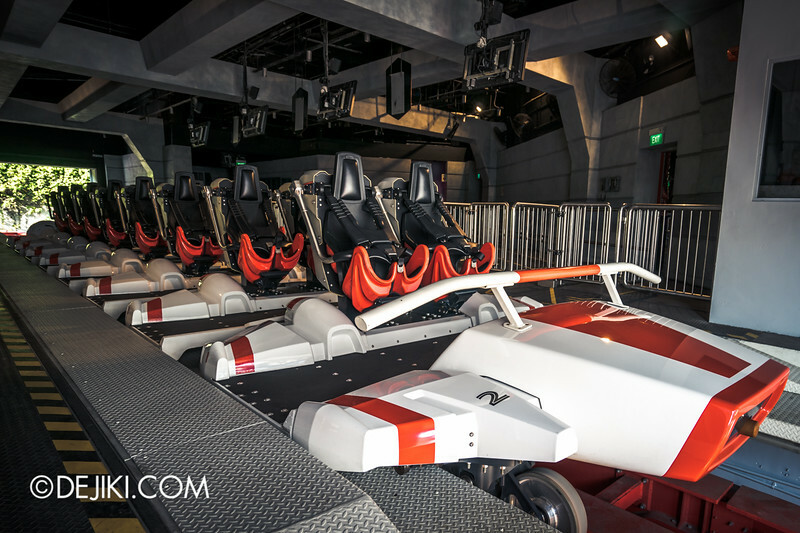 Step up into the launch bay, where you can see the NEW Viper roller coaster trains up close! At long last, Battlestar Galactica has returned. 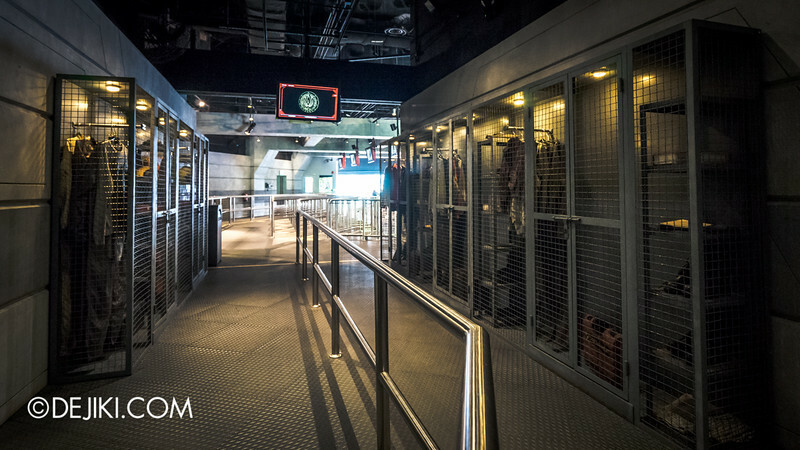 It might seem like the most thrilling ride at Universal Studios Singapore, but BSG is much more than that. The iconic sound of the ride launching. The deep rumble as the trains roll along the tracks. The screams from park guests. All these can be felt from almost everywhere outdoors. Essentially, this is the heart of Universal Studios Singapore. 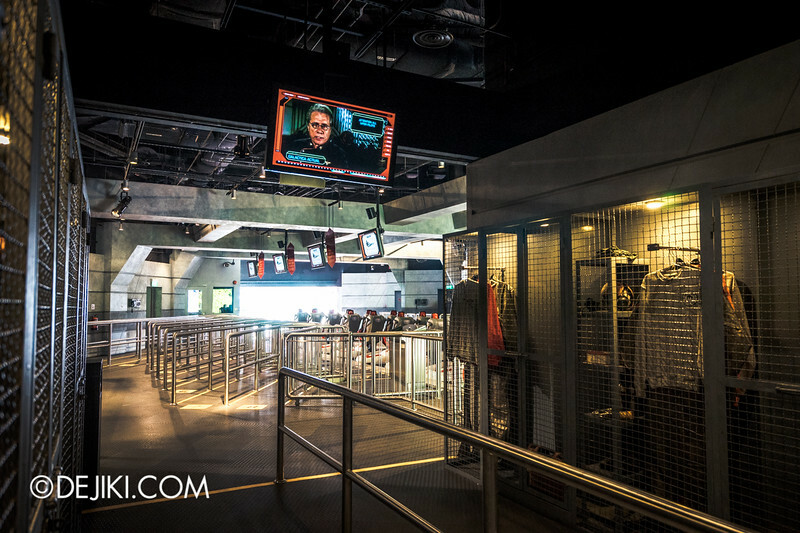 Both roller coasters reopened to some fanfare – guests running in excitement into the rides’ queue, and the wait times held quite steadily at an hour for most of the day. 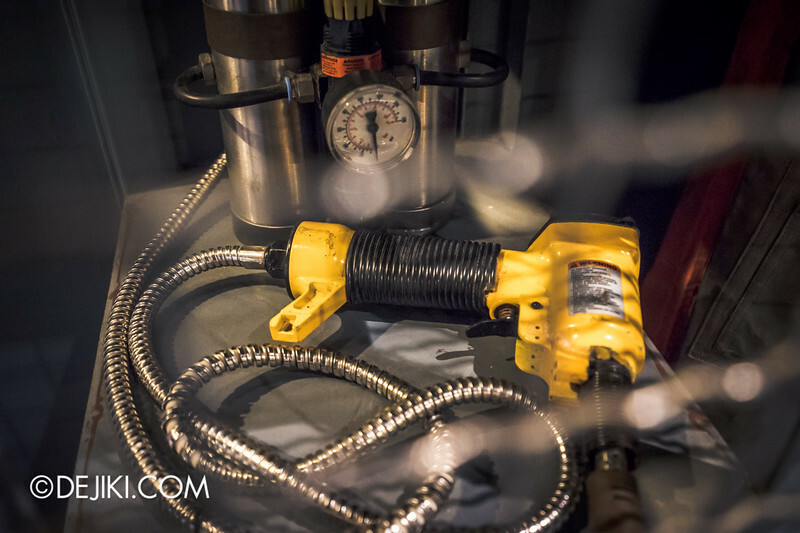 The park quickly rolled out the second pair of ride vehicles to double up the ride capacity. The crew struggled at the start causing long delays between dispatches, but they picked up the pace in the afternoon. 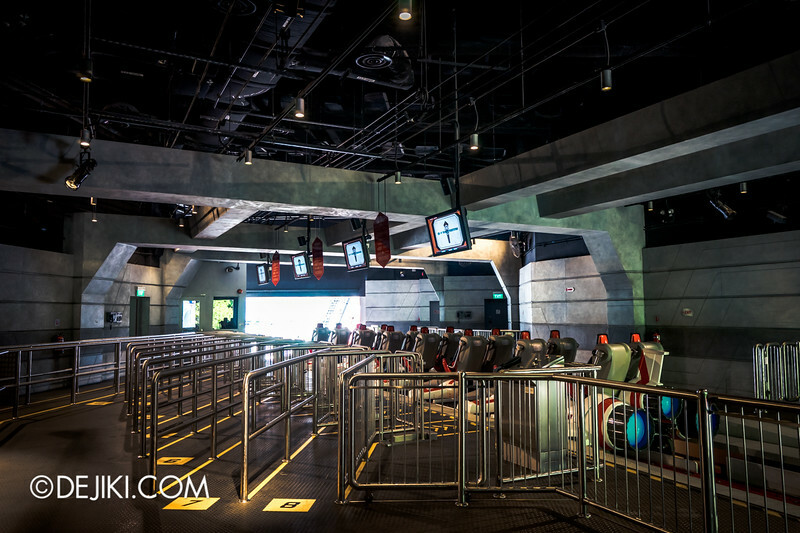 How does the ride feel now with the new roller coaster trains? It seems much faster, or at least… the Viper is more relentless. That last turn over the Sci-Fi City fountains (before diving next to the Accelerator) no longer loses speed dramatically now. With less seats at each row, the wider ‘every seat a window seat’ view makes it easier to observe how the train duels with its counterpart while on-ride. Even with new ride vehicles and some track modifications, BSG:HUMAN still feels familar. It is defined by the steep drop from 42.7 metres and the train’s top speed of 90km/h. 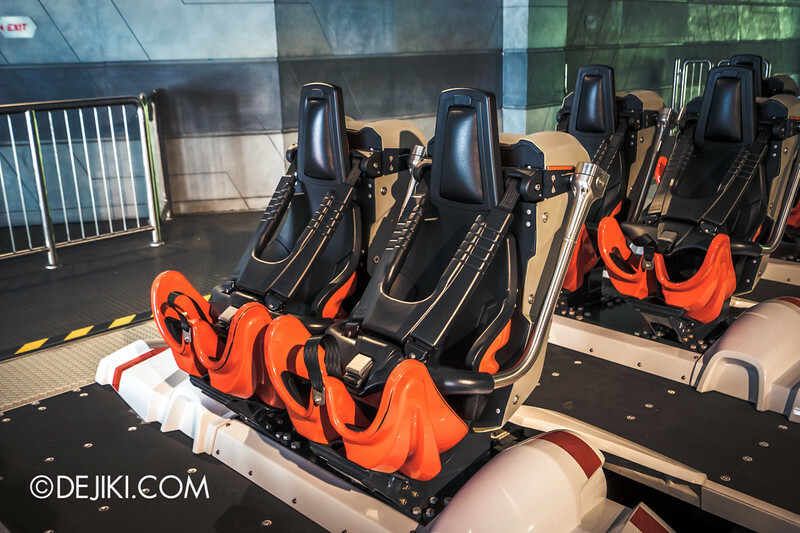 What has improved tremendously is the trains’ stability – no more heavy ‘headbanging’ jerkiness at the banked turns and segments with high positive g-forces. 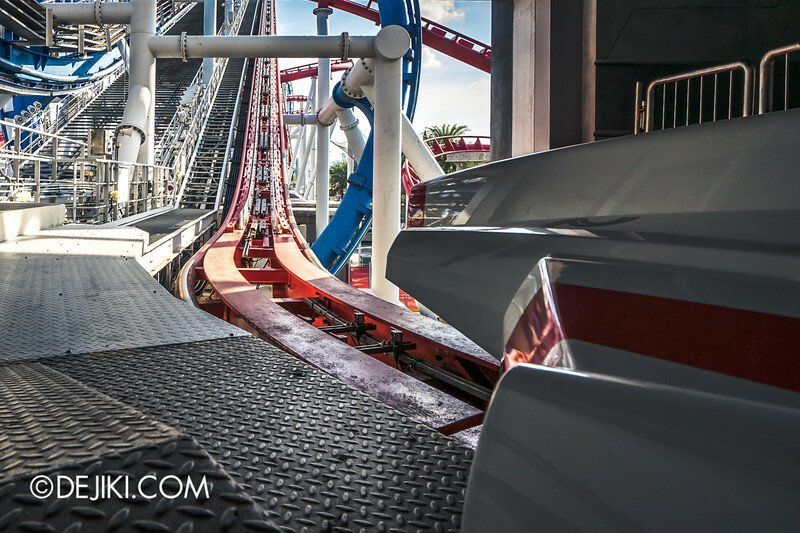 It feels a lot smoother on the tracks, with some minor vibrations to remind you that it’s a Vekoma roller coaster. 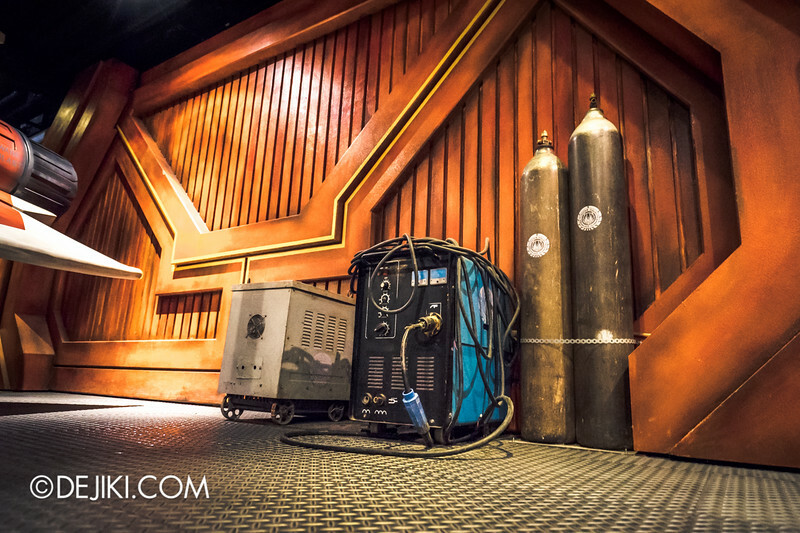 Guests who get headaches from riding the original BSG:HUMAN will be glad to know that it may be less likely to happen now. 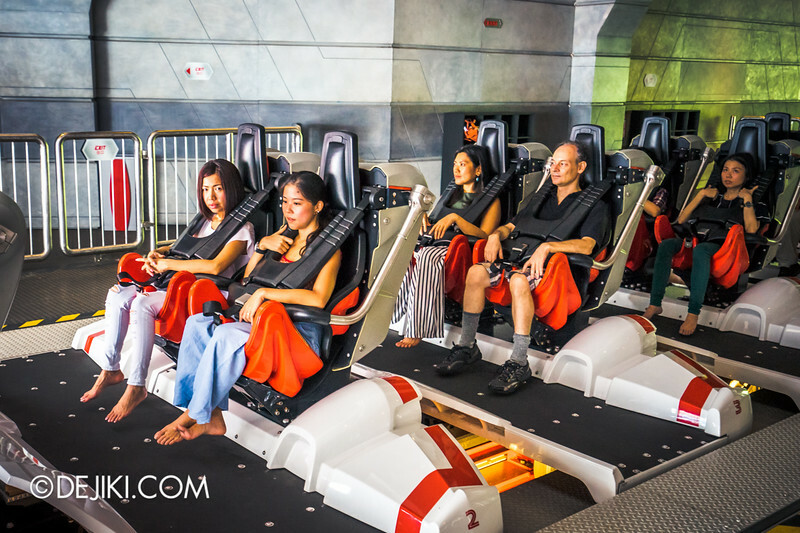 To celebrate the reopening of Battlestar Galactica, Universal Studios Singapore is offering discounted adult tickets bundled with a free meal voucher and gift – a $95 value for just $68. Meal vouchers may be used anywhere at the park except in K.T’s Grill. The gift given out on the first day of reopening are BSG-themed pens usually priced at $4.90 each. BSG:HUMAN ride crew wear uniforms inspired by Colonial Deckhands (mechanics). 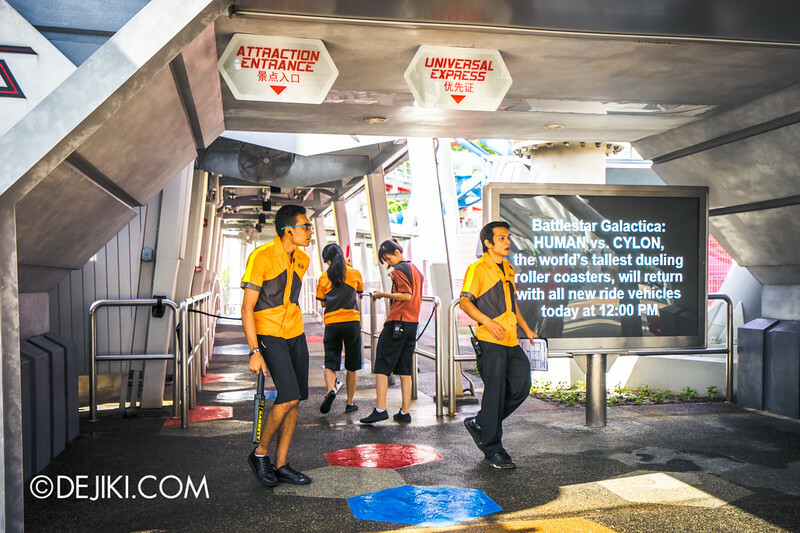 We will now continue the Battlestar Galactica: HUMAN vs CYLON Grand Photo Tour. This is the Colonial Viper Mark II – and it’s rather special, not because it’s flown by Kara ‘Starbuck’ Thrace, but also as it’s numbered B757NC. Tip: Watch the re-imagined Battlestar Galactica TV series up to Season 4 to learn more about its fate. 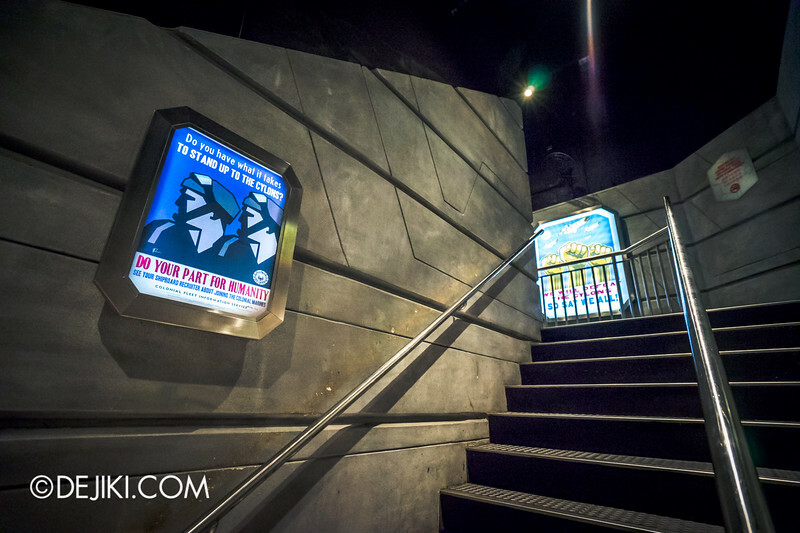 The launch bay is upstairs. 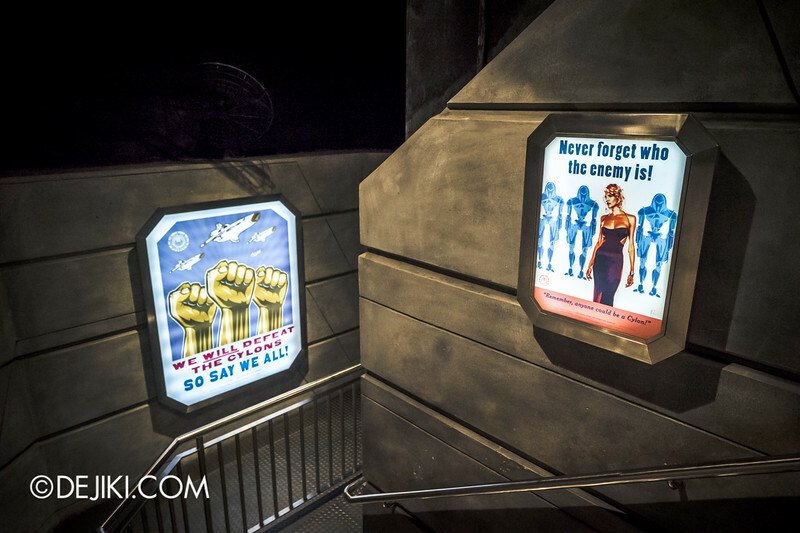 On your way up, don’t miss these Colonial Propoganda posters*. 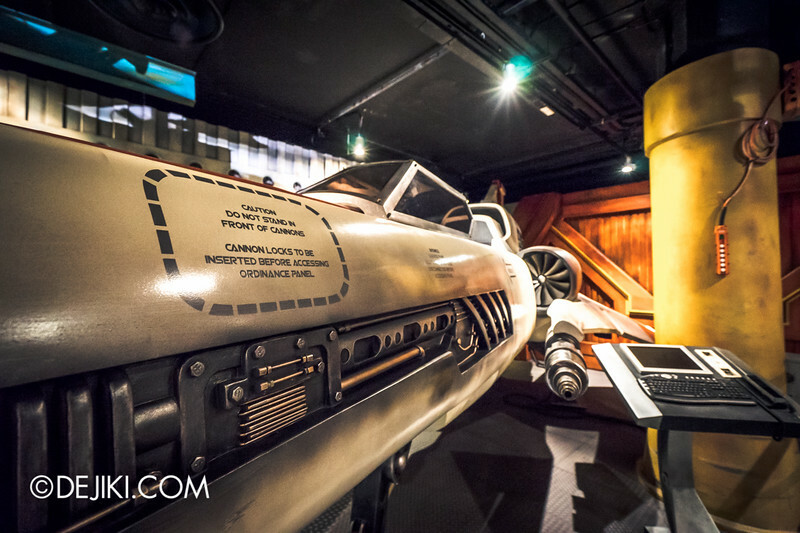 *Also available as souvenir magnets at Galactica PX. Two rows of lockers line the path before the launch deck. 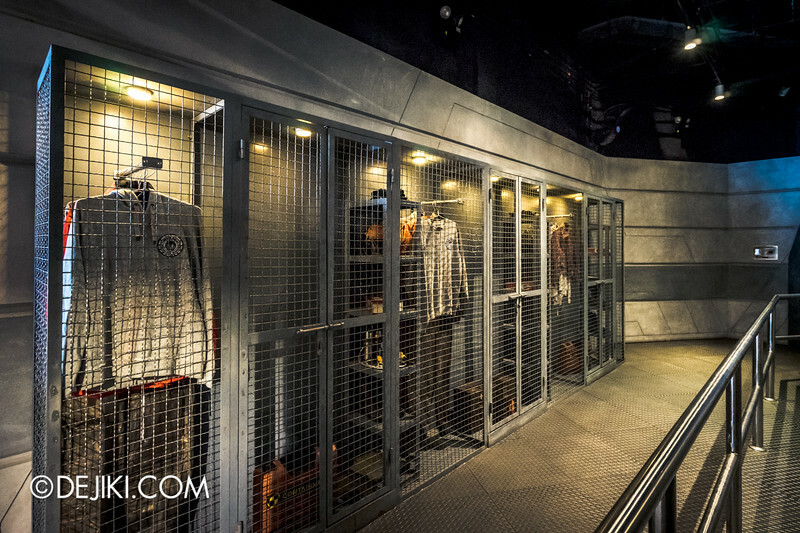 They’re filled with Galactica Apparel™ and other uniforms worn by the deckhands and pilots. 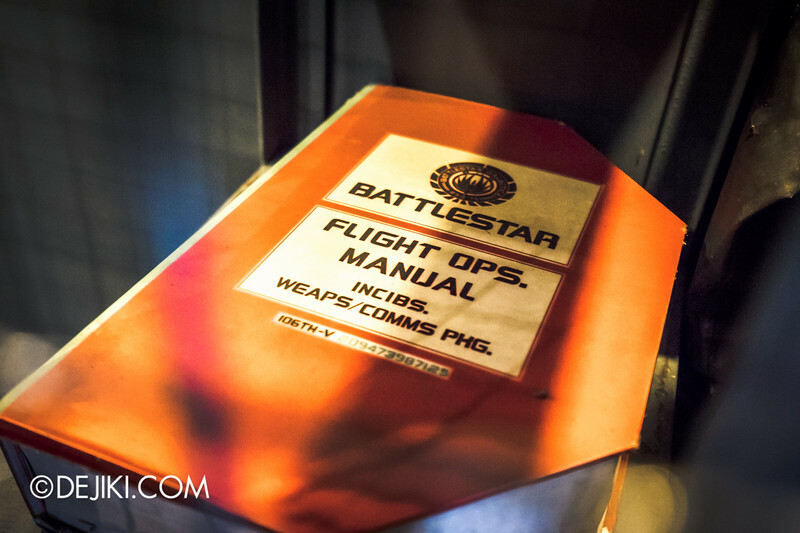 Scattered among some of the shelves are memos and even flight manuals. And like every piece of stationery in the TV series – there’s nothing but cut corners. It’s a mystery of the octagons. 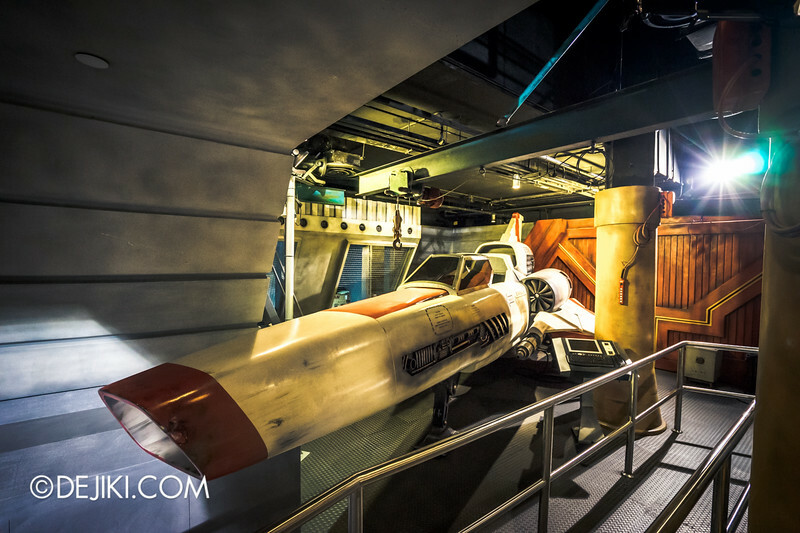 Galactica Actual (Admiral Adama): Attention All Viper Pilots! Are you ready to fly? The deckhand on duty will assign you to one of the 8 rows. Each row seats two riders. 2. Sit back, pull down your the safety restraints and connect the belt buckle in front of you. If you’re lost (how did you pass your flight training?? ), don’t worry – a deckhand will be ready to assist. 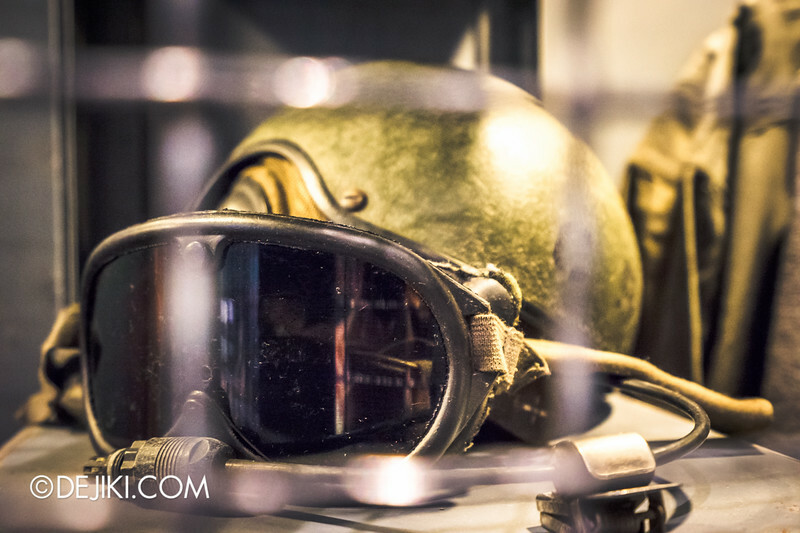 Once flight authorisation is obtained from the Combat Information Center (CIC), the deckhands signal that the Vipers are ready to launch. Happy Hunting. So Say We All. Was there no re-opening ceremony with a performance, like the Puss in Boots opening? I was hoping they’d have Cyclons and other characters from the Battlestar Galatica show. That would have been pretty cool. There wasn’t a show for Battlestar Galactica’s reopening. Yes, that would be cool to see!